← Is The Virtual Library Doomed? In the first few weeks of our course, we have read and talked about two separate cultures – oral ones, and literate ones. In the past, especially, oral cultures have been thought to be more simple, primitive, and not as advanced or smart as literate cultures. Of course, this comes from the thoughts of the literate, and is just a bit biased. However, certain segments of readings (past and present) started to combine for me under an umbrella of how “superior” literate cultures have been, and how “inferior” oral ones have been treated. I wondered about things like religion, explorers, the treatment of First Nations peoples, and how it would relate to us today. In a recorded lecture, as well as his book, Avatars of the word: From papyrus to cyberspace, James O’Donnell noted that the command and control of the written word, held by major religions (Christian, especially), was a major factor in how powerful and influential they became as groups. When they were able to write what they wanted – perhaps as the given (oral) words of their god(s) – they became elite keepers of knowledge. They had a connection and status that was at least perceived as powerful and sacred (Ong, 1982). When they were able to print these publications faster, and in greater numbers, their message could be spread to even more people, and their power would grow. Who better to spread their written word and beliefs to than those who had no idea about how inferior they, themselves, were? As mentioned by Chandler in “Biases of the Ear and Eye”, oral / illiterate cultures were thought, in the times of European explorers, travelling the world, to be “primitive”, “simple”, and “pre-logical”, rather than “civilized”, “advanced”, and “logical”, as literate cultures thought themselves to be. Gelb (1952) called the forerunners of writing “limited” as opposed to “proper” writing forms / cultures. Most explorers and religious leaders really thought they were doing good, just work when they attempted to spread their Christian beliefs and their own language / culture around the world. 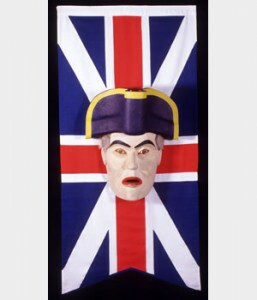 It was not all just about power – they thought they were saving primitive, simple, ignorant souls when they “educated” the largely oral cultures they met. Of course, though, not every person in every oral culture welcomed this set of beliefs, values, and literate ways as much as the explorers thought they should. Even in the art of oral and literate cultures can be seen certain attitudes and values. 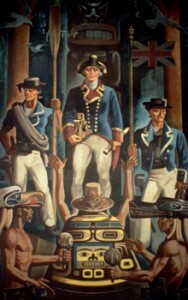 First, consider the painting called “Captain Vancouver”. It was painted by Charles Comfort in 1939. Comfort was a Scottish-born Vancouver resident who imagined the meeting of Captain Vancouver and a local First Nations group at a potlatch. Notice how tall, in command, relaxed, smug, and unimpressed Vancouver and his men look. In contrast, look at the bottom of the picture to see how low, tense, submissive, dark, and unimportant the Kwakiutl men look – you cannot even see the leader’s face. There is much unspoken in this image that relates to the value of one culture over another – in this case, an oral / dark-skinned / “primitive” culture versus a literate / white / “civilized” culture. In contrast, look at our next image. It was created 58 years after the painting above, by David Neel, a Kwakiutl artist. His image of Vancouver, from the point of view of a First Nations member of British Columbia, is far less flattering – look at the pale, uncompassionate, scowling, harsh face – hardly civilized, is he? Let us not even get started on the topic of residential schools and the overall loss of culture – the effects of which First Nations people in our country deal with to this day. It was, perhaps, the truly ultimate show of a literate culture trying to exercise and build its power over that of an oral one, by literally placing members of one into the daily life of another, and forcing assimilation. I do not mean to say that all members of all literate cultures oppress the “weaker” oral cultures and that nobody has ever found anything to support the oral side. On the contrary, studies have been done (as mentioned in Chandler’s article – Cole and Scribner, 1981, for example) which show no intellectual dominance by one group over the other. What I want to focus on is that, in the past, groups of people have been in control of powerful forms of text or information, and that they have used that to better their position in some way (while justifying it, using the same textual skills) – sometimes at the expense of other groups of people, whether either or both groups were aware of it, or not, and whether they were aware that the control of text or a method of conveying information was a key player. I wonder, in this very digital age, which groups are being marginalized the most by those who are in control of digital information and its devices. Some of us can be so ruled and influenced by technology, it reminds me of what Postman called a “technopoly”, or how Heidegger warned of how technology could reveal or enframe us – or shape us once it was created and in our use. Are people without the Internet or the latest devices in danger of being paved over by the information superhighway? Or are they just as equal as an oral culture is to a literate one – just different? Will their mark have just as much chance of being left and preserved as everyone who is part of the technopoly? Gelb, I.J. (1952). A study of writing: The foundations of grammatology. Chicago: University of Chicago Press. Heidegger, M. (1977). The Question Concerning Technology. Basic writings: from Being and time (1927) to The task of thinking (1964) (pp. 3-35). New York: Harper & Row. This entry was posted in Commentary 1 and tagged digital divide, Future, literacy, Ong, orality, postman, technology, text. Bookmark the permalink.